A photorealistic fabric logo mockup designed by Qeaql-studio. Place your colored logo design, typography or logotype inside smart object and change the color of fabric according to the color scheme of artwork. You will get a super close to reality outcome of your design. 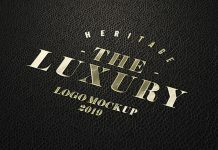 We have a great variety of logo mockups in our branding section do check them out. If you like our free mockup collection subscribe and receive free email updates.